JUMPER:Zara. JEANS:h&m. LEATHER-CHOKER:h&mTrend. HEELS:Topshop. BAG:Vintage. WATCH:asos. Pink, again? I cant believe it myself! Guess I definitly can't hide behind that 'I hate pink' line anymore as this is its third appearance now. It is this jumper that originally helped me fall back in love with the colour since I ditched it age ten, and here I am still wearing it 8 months later. 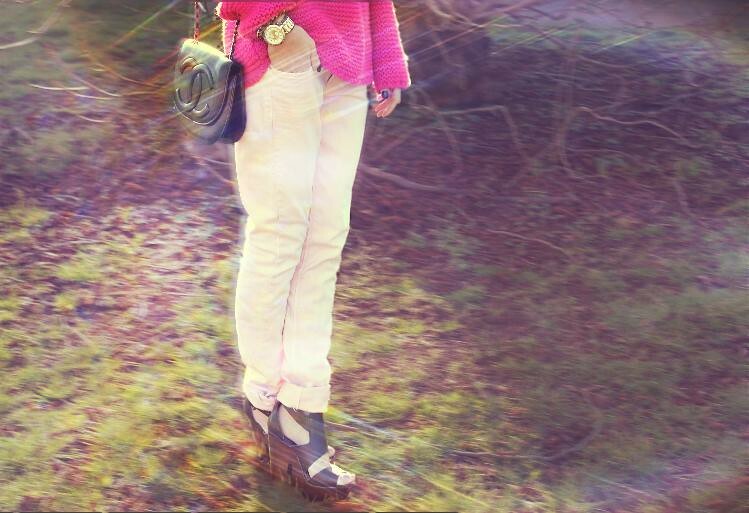 These pastel pink jeans are also an old favourite I've had for over two years, proving once again you should never chuck things but bury them like a squirrel until they're back on trend! If you're noticing my photos are getting a little more arty farty, that's because they are.. I love photography and have taken more of an interest since I took a course last year and have always wanted my blog to take on a kind of scrapbook/moodboard/story-telling theme like flicking through someones journal or sketchbook. Obviously this isn't to everyones taste and a lot of people like 'real' this is what I wore today girls' but this is my personal space so I'd like to make my ootd's more presentable and artistic (with a few lifestyle photos and music favs here and there), and coming from an Art background this isn't surprising.So look forward to a few creative changes around here..
AND IF YOU KNOW OF ANYONE WHOS GOOD WITH LAYOUTS AND HTML, HOOK ME UP PLEASE?! i think the new way of presenting your photos is great, if you have the artistic talent to be a little different then i think it's great to make your blog more distinguishable! 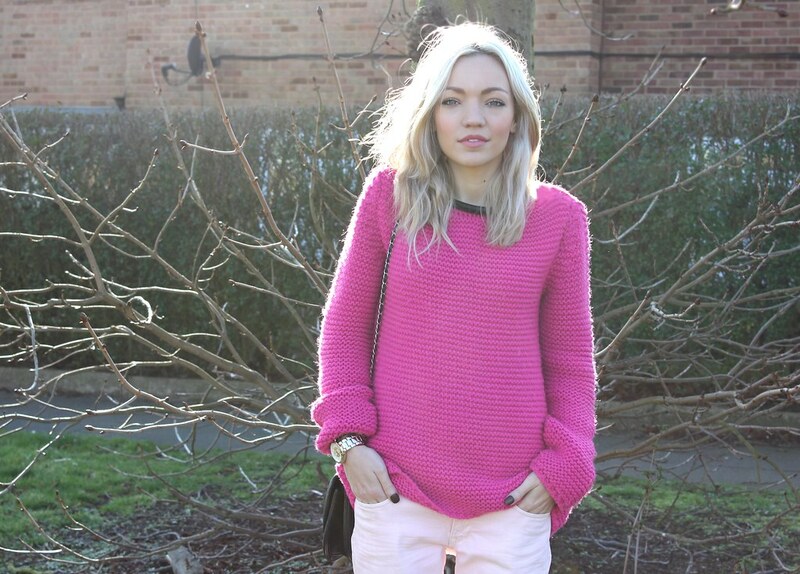 Love the knit of the jumper! You always look so pulled together and chic! I love the pink! I love that pink on your girl! Love the color of your jersey, is amazing! great look! love the jumper and bag!